If, like me, you are tired of continual references to Euro-America in local performance art discourse, then you would have relished 4A Centre for Contemporary Asian Art’s 48Hr Incident. Perhaps one day the notion of an Asian Australian gallery in Sydney’s Chinatown will be tautologous. More than 20 years after its inception, the gallery remains a vanguard, a much needed touchstone of the land we live on, its regional location and the specifics of art from these places. From the incidental to the durational, via theatre, ritual and duress, 12 works unfolded over one weekend. The accent was on politics and the social frameworks constraining individuals. A broad theme, loosely applied. The opening performance, Sydneysider Latai Taumoepeau’s Dark Continent, took place in the corner of the ground floor gallery to an audience that extended through the large vitrines to busy Hay Street. Taumoepeau sprayed herself with fake tan in half hour segments throughout the weekend. When I arrived 20 minutes into the first layer, her Tongan skin was already much darker. Seemingly insouciant, focused on the task, Taumoepeau led this benign procedure into ‘darker’ waters, shining a light on our absurd hypocrisies around skin colour. We want to be suntanned but privilege whiteness, a throwback to Europe where suntans signify wealth and health, not everyday life as they do here, even ill health in extremis. The darker the skin, the greater our discomfort, echoing Taumoepeau’s physical experience with the material, unforeseen. A consultation with a beautician didn’t give her much idea. (“What do you want to do that for? You’re already black!”) She didn’t wash for 48 hours, the accumulated tan so uncomfortable it was difficult to sleep by the second night. From the pub across the road, we watched her unroll her swag on the little dais, the walls behind stained dark now as well. From one simple gesture, layers kept unpeeling: the variation in black, compelling us into the spectrum, away from spurious binaries; into the pain, the spectacle, the self-conscious crafting of this envelope, skin. The paradoxical desire for blackness in a continent whose greatest tragedy is its expunction. By Sunday, Taumoepeau was mahogany-black. Funnily enough, one person I spoke to, who did not know her, had no idea this was not the artist’s usual skin colour. Artist Fran Barrett’s wrestle with curator Toby Chapman continued the sense of spectacle. On a blue and red square of padded mats, audience in the round, the wrestle was the culmination of 10 weeks training with an Australian champion. A woman of considerable strength and prowess, Barrett nevertheless was in a lower weight division than Chapman, even if the sport is skills-based. By nominating a doubled artist fee as her prize if she won, was Barrett giving herself an even chance? Or making a wry comment about the intrinsic vulnerability of the artist? Chapman, the curator, could only lose his honour. Salote Tawale kicked off the Saturday program with an exuberant dance to a soundtrack of Fijian lali (wooden drums). Her troupe in casual black, with masks of cardboard, some with audio tape hair, had the audience whooping and rising to join them. A joyous reminder of the ancient, extant rituals that underpin so much performance here. Northern Rivers-based Indonesian artist Dadang Christanto reworked prior performances. An interdisciplinary artist, and teacher, his work had a strong theatrical element. Tooth Brushing saw him dressed in white at a white table, cleaning his teeth with vivid red mash resembling gore. For Those Who have Been Lost commemorated victims of the Indonesian anti-communist purge which saw half a million killed. 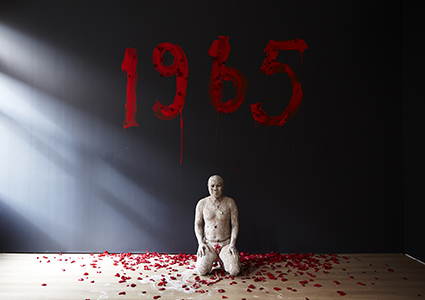 The artist daubed ‘1965’ in huge red letters on the black wall, covered himself in white clay, then strewed red petals onto the wet paint and across the floor. Scabland unfolded as a paradox of futility, the labour of the artist evident all the same. There was a touch of nostalgia for the days of a working class skilled in fabrication, and a snook cocked at the dilettantish home improvers of real estate-mad Australia. I only wish Schwensen had continued til 1am as promised, but he had worked hard, mate, so an early knock-off was fair enough. The following day, Pakistani artist Abdullah M I Syed ate money for lunch. His assistant Amanat Grewal served him two Pakistani rupee for entrée, 20 US dollars for main course and one Chinese yuán for dessert. In a sharp suit at a crisp white table, with a slightly overdetermined script, Syed diligently chewed his way through all the currency, the US notes proving especially difficult due to the sheer quantity. The inevitable retching and disgorgement was viscerally powerful and carried surprising pathos. The money was washed and distributed to the audience. Returning to the gallery for the finale on Sunday night, I found the street echoing with music so loud I thought a band was on at the Capitol Theatre. Upstairs, in the black gallery with its punky stencils and Dadang Christanto daub, a Metallica covers band from the suburbs was going off. Wok the Rock, an artist from Yogyakarta, had commissioned them to play a set list, punctuated by his recounting of a riot at a Metallica concert in Jakarta. In 1993, incensed by exorbitant ticket prices, fans set fire to cars and a shopping mall, then stormed the stadium. Heavy metal concerts were subsequently banned. 48HR Incident was the third and final—and for me most successful—component of MASS GROUP INCIDENT, a series of exhibitions that investigated the place of the individual in relation to the communal, with emphasis on political action and art with a social conscience. It was vibrant and provocative with an easy reach across region and generation. I can still hear Samson Young’s Nocturne, a soundtrack of war that ended the first day. From a large drum, and sundry materials including dirt, leaves and cornflakes, this Hong Kong artist generated eerie audio for video clips of Gaza and the Gulf War. Transmitted through little radios, unsettlingly beautiful, it stayed with me long into the night.